LinkedIn is currently the most popular professional networking site, with 100 million members worldwide, including 23,1 million in Europe. It largely surpasses Viadeo (35 million worldwide, 8,1 millions in Europe) and Xing (10,8 million worldwide, popular in German-speaking countries). And it is growing at the frantic pace of 1 million new members a week, the equivalent of a professional joining the site at faster than one member per second. According to a recent social media study conducted by Performics, the performance marketing agency owned by Publicis Groupe, 59% say that LinkedIn is the most important social network account. In France, as of January this year, more than 2 million professionals use LinkedIn, i.e. 72% more than the figure in the same period last year. It makes the French users the fourth fastest growing in the world, only behind the Brazilians (428%), Mexicans (178%) and Indians (76%). The LinkedIn site in French was launched in 2008 to respond to the French’s strong apetite for networking (Laurence Bret-Stern, LinkedIn Marketing Director for EMEA). According to their research, 84% professionals in France look to their networks to make their professional goals happen. The research also found that 50% of French professionals intend to change their job in 2011. The fact that all executives from all Fortune 500 and CAC 40 companies are registered in LinkedIn, and most of them are considered the major decision makers for their companies imply that professionals can now hardly afford to ignore the networking site. Many of LinkedIn members join their first groups to associate themselves with a university, company alumni group, trade organization, or professional interest. Having the logos of these groups on your profile adds depth and color to your professional identity on the Web. The Groups give space for members to keep in touch and discuss issues that are of common interest. Today there are at least 18 millions users subscribed in LinkedIn Groups, producing at least 1,2 million posts and comments to their groups per week (including likes, jobs, news and shares). The figure is growing speedily at around 1,5 million new memberships in Groups per week. Many active LinkedIn users nowadays join at least five Groups (and I may have underestimated the figure). Although they know how to get the most out of their groups memberships, they don’t necessarily have sufficient amount of time to be active in all of them. Follow specific discussions only. Use the tool for ”following” to keep an eye on the specific discussions you care about most, without having to visit the Group page all the time. Get the setting right. Don’t forget to set your Group’s digest email (daily, weekly or none), announcement and member messages according to your preference and avoid unnecessary emails in your already-crowded inbox. To manage your setting go to your Group page, click “More” and select “My Settings”. Post news or blog article (with a link attached). It is one of the best ways to participate in groups, as it takes less preparatory work and thought than starting a discussion. Every news or blog article you post will appear on the walls of all the group members, which means that it will give you visibility and reputation, especially if other fellow professionals decide to “Like” and/or “Share” your post. If one Professional “Like” it, your post will appear on his/her wall, visible to all his/her contacts, provided that the Group both of you share is public. Tweet at the same time. When you share an article in the Group page, connect the post with your Twitter account (click the tiny box next to the light-blue bird logo). This way you achieve two elements of visibility with one action. Share smartly. When you find a brilliant and worth-sharing article posted by your connection appearing on your LinkedIn wall and you want to forward it to some groups, you don’t need to copy the link to paste it on each of the Group page. There’s a much faster way to do it: click “Share” and then tick: (a) post to updates + twitter, (b) post to groups, and/or (c) send to individuals. Display only the prioritized group(s). If you keep visiting the same few groups more often than the others you’ve joined, put them in your prioritized-groups list. Create a short cut to these Group(s) in your main navigation. Here are the steps: (a) Go to the main navigation “Group” and select “See all”; (b) Click “Reorder”, next to “Groups You’ve joined”; (c) Choose which groups display in what order in the main navigation, and then click “Save changes”. Find More Relevant Groups. It’s possible that you have overlooked a more suitable group, or someone else recently created a group more relevant for you. Your interest may recently shift direction or focus, or you simply need to keep an eye on larger audience. 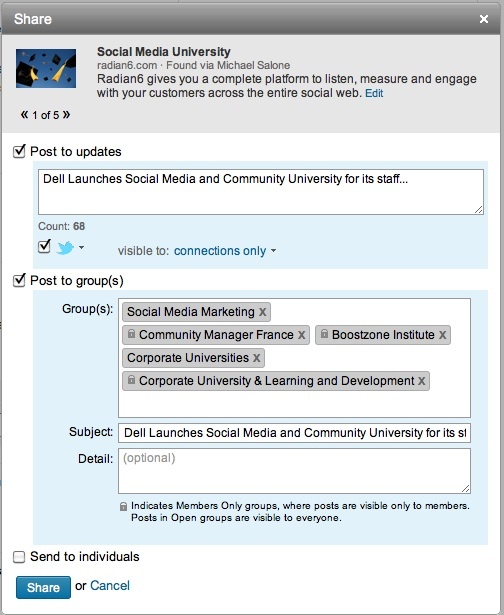 In order to be always in the loop for the right Groups for you, check regularly the list of “Groups You May Like” (in your main navigation). If you know more ways to be time efficient in participating in LinkedIn Group, please do share!